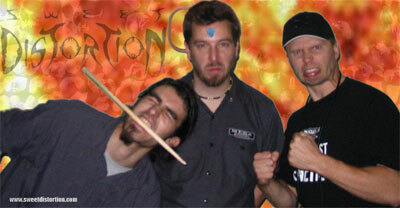 Sweet Distortion is a heavy rock band with mass appeal from the cold land of Montreal, Quebec/Canada. We mix the raw energy of thrash metal with the melodic side of System of a Down, spicing it up with the hard grooves of Pantera and old school heaviness. The result: loud high energy music having both mass appeal and a serious artistic vibe! In the studio we're meticulous and precise. Our gigs are hell raising and stage storming aggression!! The songs on our Life Kills album come in different shades of aggression and are not simply repeats of the same. Frequent comments are that people will play the CD over and over again, and that the songs really stick in their heads. The album is full BROADCAST QUALITY. It was recorded at Cyberlogy studio, who has produced gold records. It's READY TO GO. WE'RE READY TO GO FULL PEDAL TO THE METAL. We have our Sweet side, and our Distortion side. But weÃ?Â? 're ALL about INTENSITY, WINNING, and MAKING A MARK ON THE MUSIC SCENE!